Heat the oil and half the butter in a large lidded casserole. Season the chicken, then fry for about 5 mins on each side until golden brown. Remove and set aside. Melt the rest of the butter in the pan. Add the onion, then fry for about 5 mins until soft. Add garlic, cook for about 1 min, add the mushrooms, cook for 2 mins, then add the wine. Stir in the tomato purée, let the liquid bubble and reduce for about 5 mins, then stir in the thyme and pour over the stock. 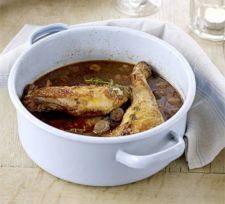 Slip the chicken back into the pan, then cover and simmer on a low heat for about 1 hr until the chicken is very tender. Remove the chicken from the pan and keep warm. Rapidly boil down the sauce for 10 mins or so until it is syrupy and the flavour has concentrated. Put the chicken legs back into the sauce and serve.